The Boulder Farmers Market was named the #1 Farmers’ Market in the U.S. by USA Today’s 10Best Reader’s Choice. Experience Boulder like a local. The Boulder Farmers Market has become a weekly ritual for Boulderites. Established in 1986 by a handful of local farmers looking to sell farm-fresh produce directly to the public, the Boulder Farmers Market is now the largest in Colorado. As a grower-only market, shoppers are guaranteed the best selection of locally grown, seasonal produce, eggs, cheeses, meats, herbs, flowers, wines and gourmet food products available in Boulder County, most of which is organically or naturally grown/produced. They also get to meet and learn directly from the farmer how their food was grown, when it was picked, how to keep it fresh and, in many cases, new ideas on how to prepare and enjoy it. Serious foodies and local chef’s shop early to get the best selection, especially during the summer when the leafy vegetables, corn and Colorado-grown fruits arrive. The outdoor food court is a popular meeting place for breakfast and lunch. The combination of freshly brewed coffee, baked goods and a variety of prepared foods by local chefs — together with live music and shaded seating — provide a place to relax and meet up with friends before or after shopping at the market. Market vendors stop selling at 2pm sharp, except in the food court, which continues serving until 2:30 p.m.
As if this wasn’t enough reason to visit the Boulder Farmers Market, a fine arts and crafts fair featuring 25 jury-selected artists and artisans is held one Saturday each month in Central Park adjoining the farmers’ market. This highly competitive market attracts some of Colorado’s best artists and crafts people. It’s the perfect place to find that unique gift or memento of your visit to Boulder. 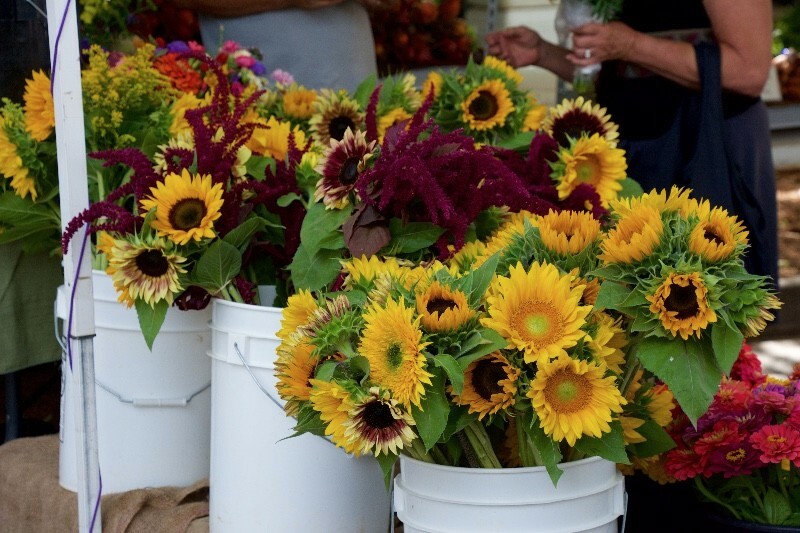 Also read the Insider’s Guide to the Boulder Farmers Market. No pets at the market, please. Did you know that according to a recent study conducted by the National Endowment for the Arts Boulder has the third largest concentration of artists in the country? The 6th annual Boulder Arts Week will take place on March 29–April 6, 2019 at venues throughout the city. Celebrating Boulder Artists, the Week is Boulder’s only large-scale, inclusive celebration of our community’s vibrant arts and cultural offerings, promoting and celebrating our city’s thriving creativity. Join us to celebrate the city’s excellent artists and arts and culture offerings such as FREE AND DISCOUNTED art walks , exhibitions, performances, dance, music, theater, public art, artist demonstrations, lectures, readings, and workshops. Below is the website for all of the incredible events! Detailing locations and times through out the week. Go enjoy all the beautiful colors, music and culture of Boulder and it’s fine artists! Happy Spring! Travel Boulder is a fabulous magazine launched in early 2018 by well-known journalist and Colorado native Aimee Heckel. The goal of Travel Boulder is to help long-time residents, those new to, and those visiting Boulder connect with the community and make the most of their everyday experience. They do this by creating what they refer to as the “ultimate guide” which connects you with local arts and culture, family-friendly activities, live music, events and festivals, restaurant guides and reviews, shopping suggestions and more. This month’s articles included a feature on Boulder’s newest health food restaurant, Flower Child, opened at 2580 Arapahoe Ave. #110 and owned by Hannah Timm who describes the restaurant as “fast and casual” and hopes to bring together a group of “dynamic personalities willing to learn and grow with a great company.” The menu is fresh and flavorful, and the staff is happy to help you find exactly what you are looking for–even if that means making substitutions! Other articles published recently feature a list of new businesses opening in the downtown Boulder area this year, those that are closing, the announcement of an “American Ninja Warrior” training gym opening in Lafayette and even an article on how to camp (without the tent!). Though the magazine is still relatively new to the Boulder area it’s already garnering the public’s attention. Their social media pages have been gaining followers consistently and circulation has nearly doubled since January 2018. Not only is the magazine a great place to advertise, it’s also a great place to get involved and make connections within the Boulder community. Staff writers live in Boulder, are in tune with the pulse of the town and can offer fantastic recommendations, all of the advertisements are for great local businesses, so what are you waiting for? Check out Travel Boulder online or in print today! There is a digital version of the magazine available online at www.travelboulder.com, and a print version of the magazine is available at the Boulder Visitor Center, the Boulder Chamber, Chautauqua Park, and numerous other locations around town. Aimee Heckel is the current editor of Travel Boulder. Travel writing has always been a focus of Heckel’s which is what inspired her to create and become the head writer and editor for TravelBoulder.com. She has traveled the world extensively to write about humanitarian issues, and even spent time attended college in Germany before graduating from Colorado State University. Since then Heckel was named the top journalism graduate in the nation and has worked as a contributing editor for USA Today, a staff writer for the Boulder Daily Camera for over 15 years and has contributed to more than 40 books both as a writer and editor.